Showing your support for someone close to you dealing with breast cancer. Knowing that someone special is there providing support, help and most of all love during this difficult time is something to be cherished. 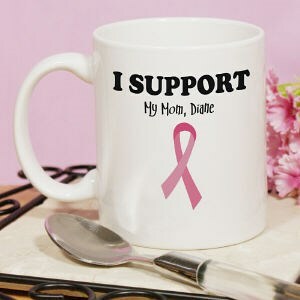 Show your support with your own Personalized I Support Coffee Mug. MyWalkGear.com has many additional Personalized Breast Cancer Awareness Gifts for your special gift giving needs. Each time a gift is purchased from our Breast Cancer Awareness line of personalized gifts, MyWalkGear.com will make a donation of 15% of the purchase price to help in the fight against breast cancer.